Metal roofs are becoming a popular consideration for homeowners these days. They look great, last a lifetime, are low maintenance, and save on energy costs. Yet a metal roof price tag is about 3 times higher than a popular asphalt shingle roof. Even though many homeowners love many of the perks of a metal roof, they often forego the metal roof in place of a cheaper asphalt composition roof. But is it true that metal roofs are more expensive than asphalt roofs? Not necessarily. In fact, metal roofs can often be cheaper than asphalt roofs in spite of the higher initial installation price. 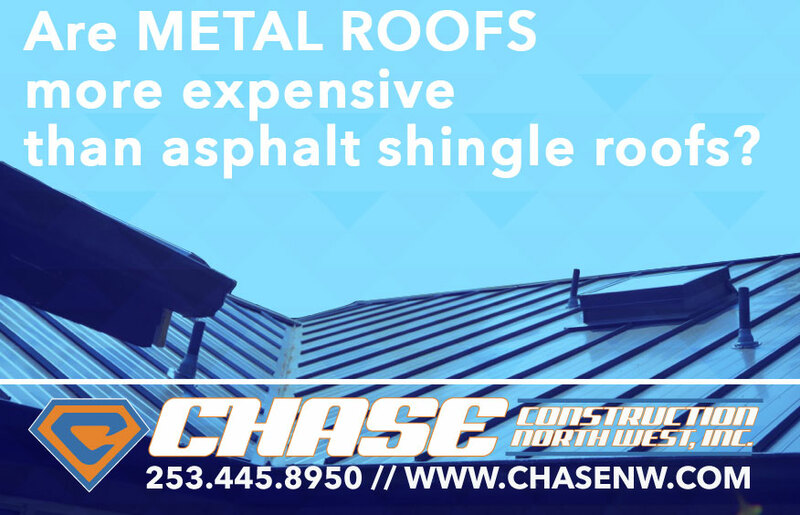 The Metal Roofing Alliance (MRA) estimates that metal roofs can cost between $800 and $1,600 per square; whereas asphalt shingle roofs can cost between $100 and $900 per square. Metal roofs have an average lifespan of 50+ years while asphalt roofs have an average lifespan of 15 years. This means that by year 45 of one metal roof, a new asphalt roof would be installed on average 4 times, a quadrupling of the average cost of asphalt roofs before a single metal roof reaches its average lifespan. Asphalt composition roof replacement costs can add up to substantially more than metal roofs over time. Even though the lifespan savings of a metal roof are the most significant, there are several other types of savings. A metal roof can result in up to 30% home energy savings (MRA). A significant portion of home heat derives from absorption of solar radiation on the roof. Asphalt shingles have among the highest absorption rates of roofing material, so when the sun hits them, they heat up the home’s living space. Metal roofs counteract this heating mechanism by reflecting solar radiation away from the house. During hot summer months, this reduces the heat in the home’s living space, thereby reducing energy costs of cooling the home. If you frequently use A/C during the summer, you’ll find you have a significantly lower heating bill after installing a metal roof. A common reason that homeowners don’t choose metal roofs is because they’re planning to move at some later date, so the upfront cost of a metal roof looks like a waste of money. At first glance, this is a reasonable assumption to make. However, when the move finally comes, costs to installing an asphalt roof can often be higher than anticipated. Not only is resale value of a home with a metal roof boosted by up to 6% (MRA), but due to how quickly asphalt composition shingle roofs deteriorate, many homeowners need to replace their asphalt roof in order to sell their house. When doing so, an average 62.9% of the roof installation cost is recovered. This means that when a homeowner chooses to install an asphalt shingle roof instead of a metal roof due to expecting to sell the house at a later date, the homeowner can expect to buy a new roof prior to a sale and lose 37% of their money put into the roof. Homeowners with metal roofs instead experience a gain in value of the home that can extend many decades after installation, all the while avoiding the cost of replacement that may come with an deteriorated asphalt roof. Metal roofs are resistant to many of the harsh weather elements in storms. They’re durable to hail, fire-resistant, and can withstand up to 140 miles per hour winds. Homeowners insurers set premium price in part on the risk of damage to policyholders’ homes. When a policyholder has a lower risk of damage to the home, their premiums decline. In areas where the risk of damage to houses from storms is high, the reduction in homeowner’s insurance premiums by having a metal roof can be significant. Roof maintenance can be a substantial hidden cost. Sometimes homeowners task themselves with the maintenance of their roofs, but that’s often easier said than done. It takes the right kind of tools, some technical knowledge, hard work, free time that would otherwise be leisure, and the very big hidden cost of the risk of injury. Oftentimes it’s a better idea to schedule a roofing contractor to conduct the maintenance instead, yet that costs money. However, with a metal roof, maintenance comes easy. They need little maintenance and when they do need maintenance, it’s often on the order of examining the roof with binoculars or spraying the roof down with a hose. Homeowners who wish to take up roof maintenance themselves are much more likely to stick to it when they have a metal roof, and it will cost them less. Even though the upfront cost of a metal roof is higher than that of an asphalt composition shingle roof, the long-term cost is often lower. Metal roofs last several times longer than asphalt roofs and don’t need to be frequently replaced like asphalt roofs do. Metal roofs hold their value well, raising the value of the home itself. And they often yield significant savings in heating costs, maintenance costs, and homeowner’s insurance. If you’ve had your eye on any of the many beautiful and diverse metal roofing options but you’re concerned that they’re just too expensive, fear not, because a metal roof could save you a bunch of money and hassle over your lifetime! What other reasons do you think metal roofs might be cheaper than it seems at first glance? Tell us in the comments. Need a new roof? Call us today for your free estimate – 253-445-8950 or fill out our quick estimate form! We look forward to working with you!